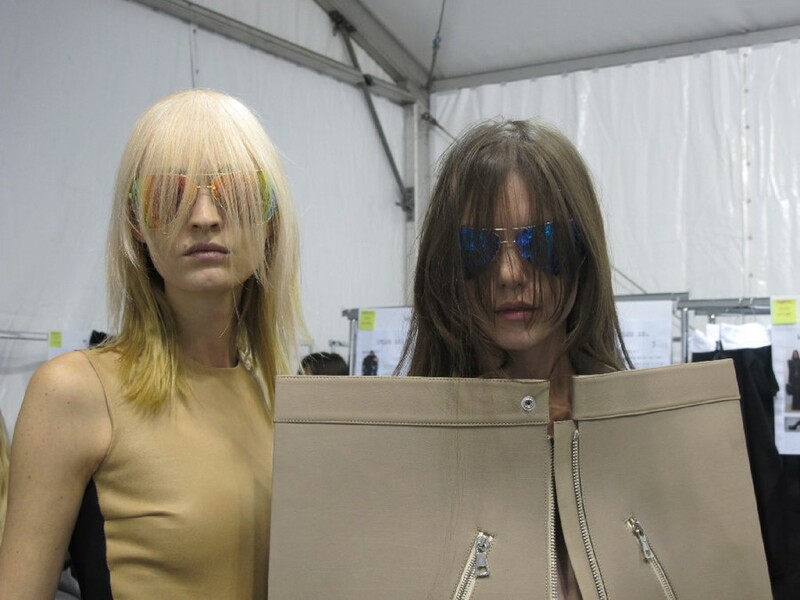 From last season's exaggerated proportions, the lab-coated team at Maison Martin Margiela took it a step further to make surfaces of clothing appear like a cardboard set, an illusion that isn't really tricking the eye but more like forcing the it to look at the surface of clothing in a completely different way. This two-dimensional trick was honed in over and over again with trouser fronts standing away from the body, shoes that were moulded upwards, away from the toes and the most visually arresting of all - shirts, jackets or any thing on the upper half were represented by a flat rectangle that were hung on the body like a clothing sandwich board. It got particularly cartoonish at the point where a sequin bustier cocktail dress was coming at you from a rectangle, as though the person wearing it had stuck their head through a beach cut-out board. The conceptual point to be made here clear enough with its repetition. However more wearable propositions were also thrown in with the luxurious boxy leather bags as well as the starting portion of shirts and jackets that were vented at the sides.